Information and news about stories I am currently working on. Ok, so I need to work on him a bit. Well, with some of the personality changes I made the plot line needs altering, and so does some of the world…. …omg, this makes it so much better, this story is becoming a tale on epic proportions…the history itself is staggering! There you have it, I’ve taken a step back on the narrative to work on characters and world building again, but scenes are now flying at me even when I am busy at work. I have to get myself organized and keep notebooks everywhere. This writing thing is starting to become fun. This is a classic brain-monkey-throws-poo-instead-of-giving-me-the-info-I-need moment! I ‘ve been struggling with a scene where a certain character must make a decision, after receiving some distressing news. <— (Not the main character.) I would like to put a similar scenario up for you to comment on and offer a fresh look from another perspective. In essence you will be contributing ideas for a scene in my story, if you take part. What follows is the setting, with some questions pertaining to various parts. I would ask for as much description as you are able so that I can view the emotions you might imagine. You are a ranking official of the CIA. You have personally trained and befriended one of your lead officers. You receive an emergency order, from your superiors, about this officer, and others in his team, for crimes of ongoing high treason, murder, espionage, and terrorist activities. You are given video, and other evidence to prove the allegations. You are given the last known whereabouts of the criminal and other officers he has coerced into other similar crimes listed. You have video proof of some of these high crimes and corroborating evidence based on some things he said to you days earlier. The order calls for the immediate termination of the criminals. Some of the murders are personal friends and/or loved ones, yet these people were some of the most loyal offers you ever worked with in the past. To what degree would you pursue the criminals? Now, say you have located there hideout and found an underground terrorist ring that far exceeds anything you ever imagined. Now you receive communiqué that these ex-officers are high in the chain of this terror cell, but not at its head. You are to eliminate the ex officers, but keep the leader for questioning. How do you respond? Please give as much of the emotional baggage that you might feel in making the decisions of this scenario, as this is where I ‘m struggling. What would be going through your mind, how would you address your subordinates? In a private moment would you break down? Note: There may be a short delay before your comments post due to my spam blocker. If you have questions or need more details or insight I will be happy to respond. Posted in Writing & Progress. I’d love to visit this cave! It looks like Superman’s fortress. 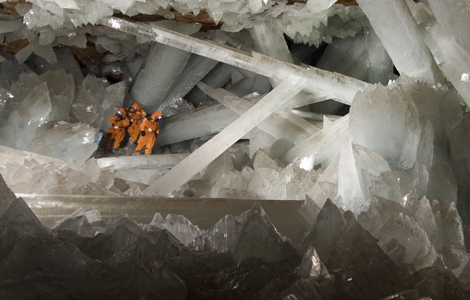 Hidden deep beneath the earth is a magnificent cavern filled with giant razor-sharp crystals. The size of a football field and about as high as a two-story building, this giant Crystal Cave may be one of the greatest natural marvels ever found. While first investigating the cave in 2008, scientists suspected it could be the doorway to a vast system of interconnected chambers. Then in 2009, tantalizing new clues came to light when miners drilling a ventilation air hole attached a camera to the drill bit. The grainy footage revealed a cavern 500 feet below and what appeared to be a new giant crystal formation. Now National Geographic Channel and the international team of scientists have returned to mount a daring new attempt to reveal even more amazing subterranean phenomena.